A Basal Dinosaur from the Dawn of the Dinosaur Era in Southwestern Pangaea. R. Martinez, et al. Science 331: 206-210. Abstract: Upper Triassic rocks in northwestern Argentina preserve the most complete record of dinosaurs before their rise to dominance in the Early Jurassic. Here, we describe a previously unidentified basal theropod, reassess its contemporary Eoraptor as a basal sauropodomorph, divide the faunal record of the Ischigualasto Formation with biozones, and bracket the formation with 40Ar/39Ar ages. Some 230 million years ago in the Late Triassic (mid Carnian), the earliest dinosaurs were the dominant terrestrial carnivores and small herbivores in southwestern Pangaea. The extinction of nondinosaurian herbivores is sequential and is not linked to an increase in dinosaurian diversity, which weakens the predominant scenario for dinosaurian ascendancy as opportunistic replacement. Plus: Researchers have discovered a new dinosaur, Eodramaeus, which lived during the dawn of the dinosaur era, about 230 million years ago. The Eodramaeus' fossils were discovered in the Ischigualasto formation in northeastern Argentina, where paleontologists have found other important dinosaur fossils. 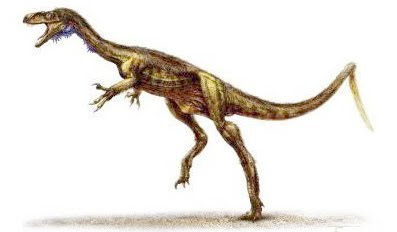 Eoraptor, generally considered a theropod as well, is in fact an early ancestor of the sauropod lineage, which includes the giant, long-necked herbivores, the researchers say. Eodramaeus had more theropod-like features in its skull, such as an opening near the end of the snout called the promaxillary fenestra, as well as other theropod-like features in its trunk pelvis and limbs, the authors report. Eoraptor not only lacked those features but also had more sauropod-like features, including enlarged nostrils and an inset first lower tooth.